vCard Export Tool is an amazing utility to transfer Outlook contacts to vCard, CSV and WAB file format in batch. 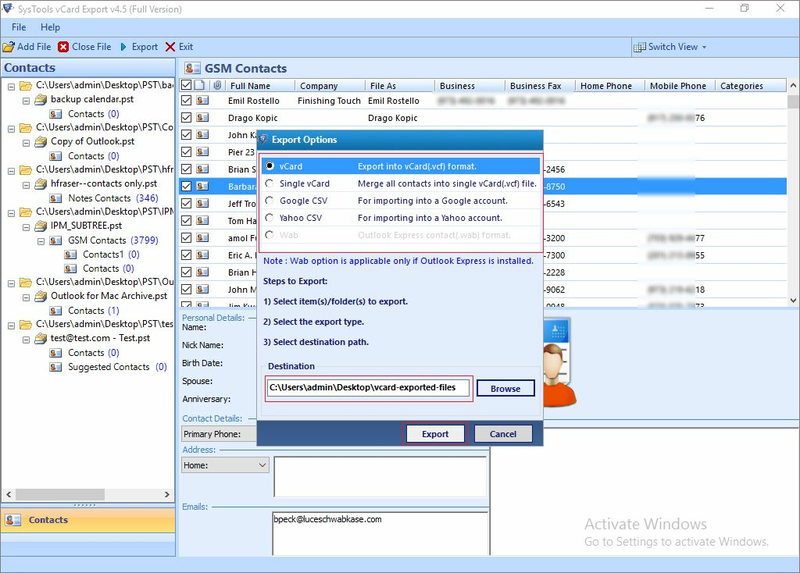 This VCF Migrator utility allows users to transfer Outlook PST to Google contacts or Yahoo contacts in a simple manner. One can move PST contacts to single VCF without any hassle. 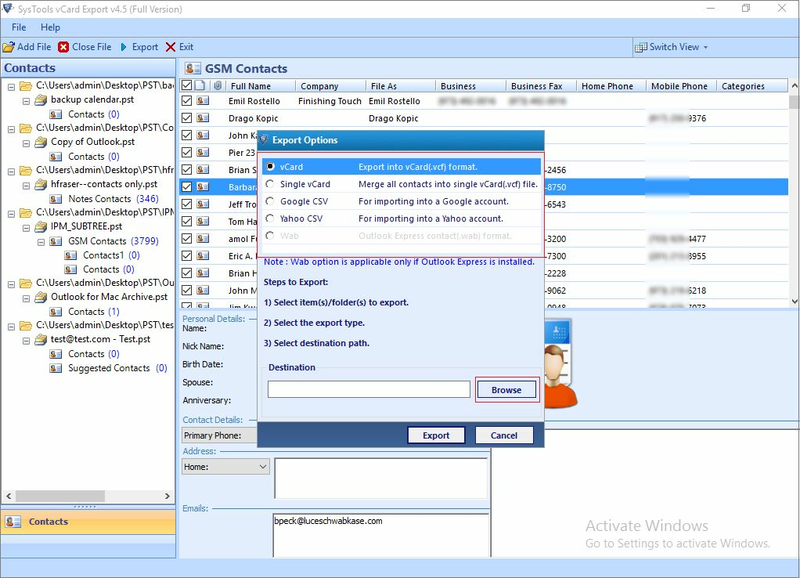 vCard Migrator software allows to convert Outlook Address book to vCard, Google, WAB and PST to CSV. 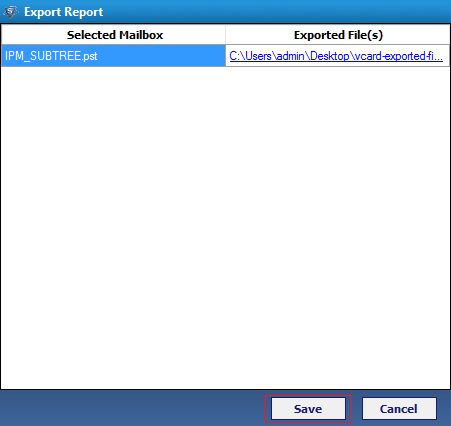 VCF Exporter utility provides an option for file selection i.e. single or multiple address book can migrate PST to Google contacts, Yahoo or vCard in few clicks. Outlook Express installation is mandatory for the proper working of Outlook to WAB software to move MS Outlook Contact files into Outlook Express WAB file format. Supported Email Applications: IBM Notes, PST, Outlook Express, Eudora, Google contacts, Entourage, Yahoo contacts etc. Devices: iPhones, Android phone or any other smartphones. Apart from all this, the VCF Migrator utility does not compromise with meta properties also such as name, addresses, email id, birth dates, contact numbers, groups and much more. 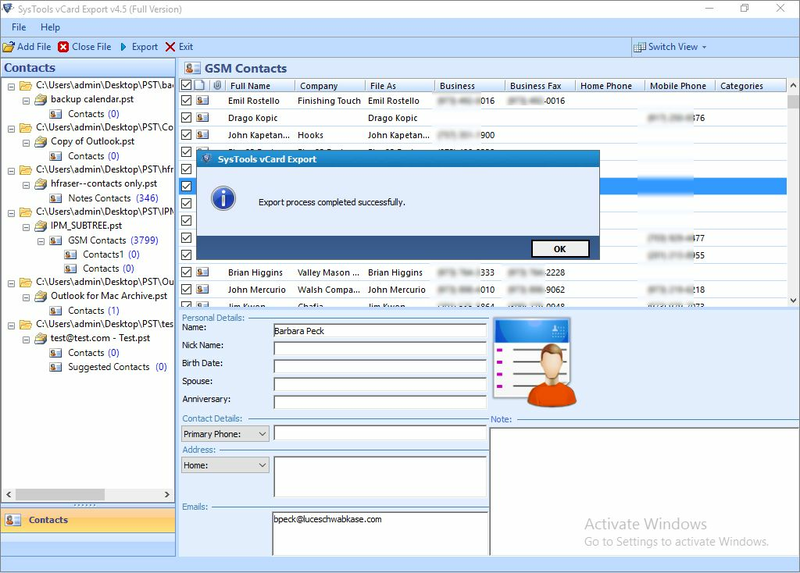 Export Outlook Contacts to vCard: The vCard Export tool provides an option to create separate vCard for each contact in PST file and maintains a common folder to save all of them. 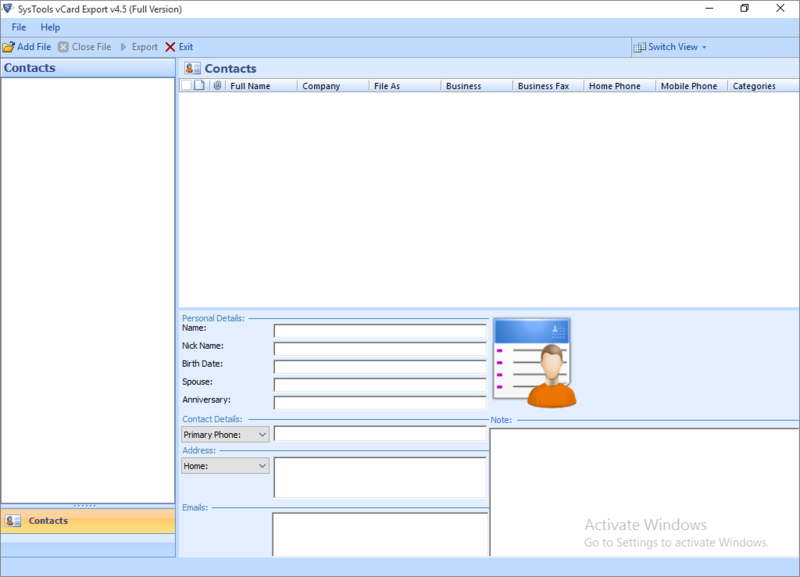 Move PST Contacts to Yahoo CSV: PST to vCard migration to convert Outlook to Yahoo account contacts. Export Outlook Address Book to Single VCF file: It allows users to create a single vCard for all the contacts. Transfer PST Contacts to WAB: Allows users to export Outlook to WAB format. Export Outlook Address Book to Google CSV: This will help in adding Outlook PST to Google contacts in CSV directly. Add File: To add, scan & load single PST at a time. 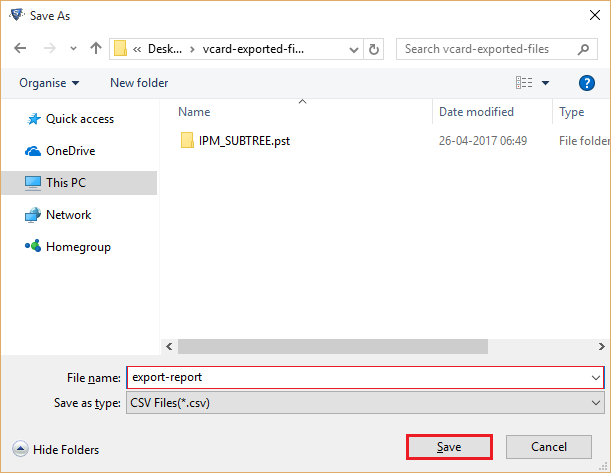 Add Complete Folder: PST to vCard migrator allows to add the entire folder containing multiple PST files and scan them altogether. Auto Detect PST File: Find automatically the PST files of the default profile. The PST Contacts to single vCard file transfer application permits users to transfer selective contacts/ folders of your choice. Select Contacts: A user can check the contacts that need to be migrated and after that right-click on it to convert the selected contacts. Select Folder to Move: A user can check or uncheck the folder that is to be exported to save the selective folder contacts. Personal Info: Name, date of birth, images, notes, nickname, etc. Emails Addresses: Save all email addresses for any particular any contact. 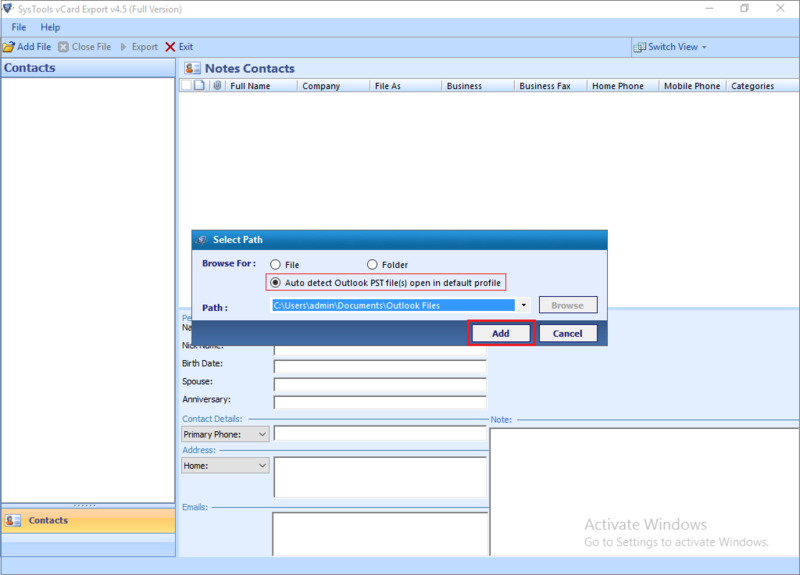 Separate vCard File for Each Contact: This provides an option to add Outlook PST to single VCF file for each contact separately. 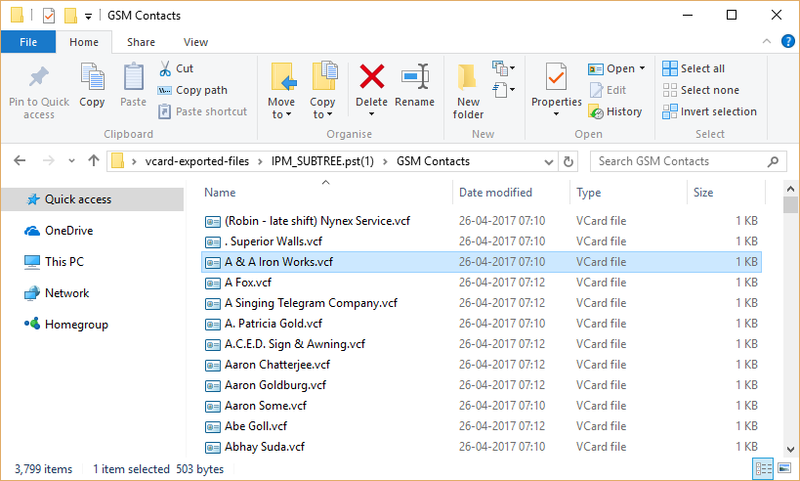 One VCF File for All Contacts: This will help in creating a single vCard contact file for all contacts in it. In addition, Microsoft Outlook installation is not necessary to perform the conversion operation. After choosing the proper transfer option, a user can save the contacts from PST at any desirable location. In addition, if a user wants, can make a new folder also directly from the Outlook PST to WAB Software pane and successfully move the files into that folder without any trouble. 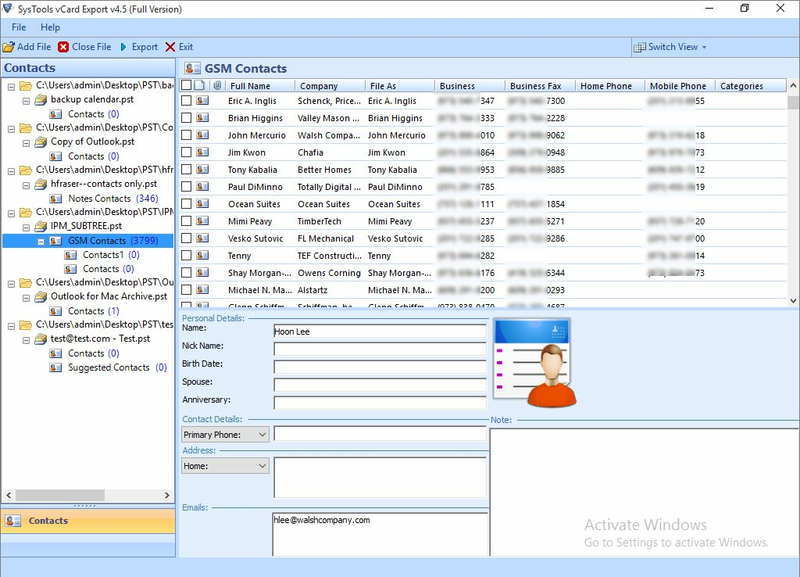 The VCF Export software provides auto sorting option to arrange the list of contacts by its fields. There are different fields available to sort the Outlook contacts in PST namely Full name, the name of the company, phone numbers, business fax number, other categories etc. Generate a single vCard file which consisting of multiple Outlook contacts. vCard Export Tool provides option to transfer Outlook contacts in PST to vCard VCF format. Since smartphones, especially Android support single vCard with multiple contacts in it. Load Single File: In order to transfer single PST file to vCard at a time by providing the path of the file. Load Entire Folder: In order to load a complete folder containing multiple PST file in it and provide the path of the folder. For example, you want to convert PST to vCard then, vCard as the output file format. Step 9 : Next, click on Export button to start the Outlook contacts to VCF file conversion process. Step 14 : Then, click on the Save button to copy the migration report to the hard drive on the Windows PC. From the Save As dialogue box, go to the folder path where the report will be saved and click Save. How to Transfer Outlook Contacts Using vCard export Tool? Q. 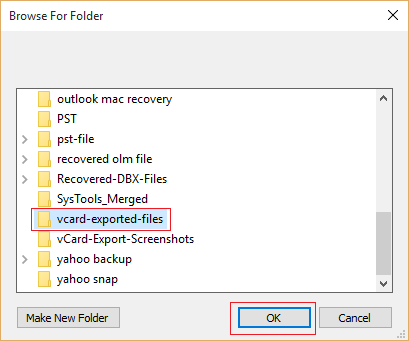 Is MS Outlook installation necessary to use auto-detect feature of this vCard Export Tool? Ans: Yes, MS Outlook installation and configuration is mandatory if you want to use the auto-detect feature of PST to VCF exporter software. Q. Does VCF migrator allow to transfer contacts from orphan PST file? Ans: Yes, the application vCard Export tool is capable enough to convert all contacts from orphan PST to Yahoo CSV, vCard, Google contacts and WAB format without any issue. Q. Will this application can convert corrupted PST files in MS Outlook? Ans: Yes, this wizard can transfer corrupted Outlook PST contacts to VCF, Google CSV, Yahoo, WAB formats without any hassle. The utility does not have any prerequisites for migrating contacts in Outlook account. Q. 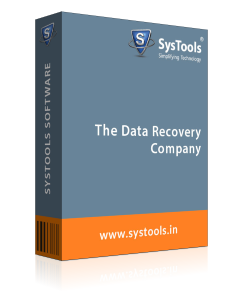 Is it possible to Move PST Address Book to Gmail CSV with the help of this PST Contactsto VCF Exporter software? Ans: Yes, the utility provides option convert Outlook to Google contacts. After that, a user can easily export this CSV to Gmail contacts very easily. Note: vCard Export Tool will get delivered on your registered email id, within few minutes after placing the order. I wanted to migrate my Outlook contacts to Outlook Express account. I have been searching for a perfect solution for a long while. Few days ago, one of my colleague suggested me vCard Export Tool. I was not confident, so I tried the trail version first. The utility worked super amazingly, and converted all MS Outlook address book files efficiently without any loss. My hearty thanks to team!! Whether it is about emails or contacts, the conversion process is always been a tough and a challenging task for me. I have tried to move PST address book to Gmail manually, but unable to perform the task accurately. Then, my colleague suggested me this VCF Exporter utility. It is really a wonderful software and I have converted contacts from Outlook to Google contacts CSV within some time. The developers seriously deserve all the applauds for such an impeccable application. vCard Export Tool has now become one of those products in which I can trust. 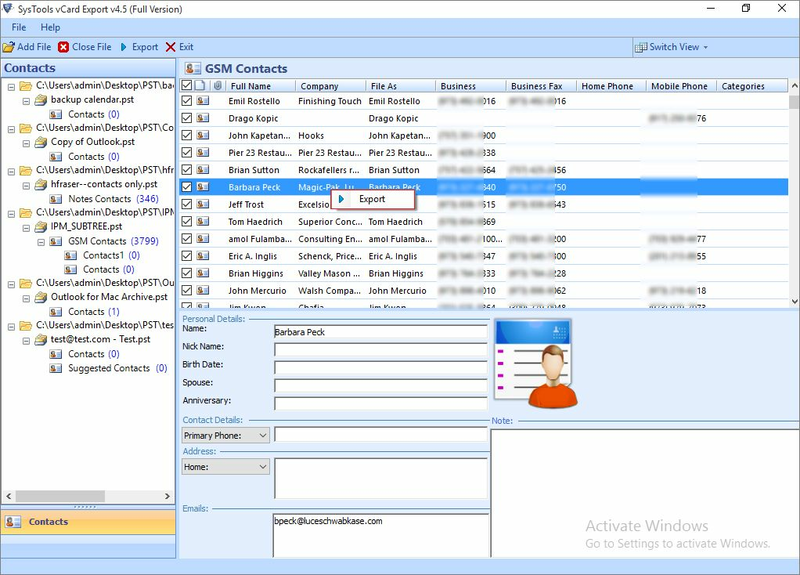 With the help of this tool, it becomes very easy for me to migrate Outlook contacts to Vcard. I have not aware of such an advanced technology until now. One of the best things about this tool is that it has a very simple interface.